Ray: One needs to be mindful of local customs, Elizabeth. Not many years ago, my son Ben went mountain climbing in Pakistan...he stayed one night on the way in a small village in the Swat Valley...the expedition guide strongly warned all the foreigners that they must avoid all eye:eye contact with the village women, or the consequences might be dire. Ray: I prefer candid shots, Chris, but don't want to be seen as Peeping Tom. Encore une jolie scène. Tu as pris des risques. Ray: J'ai essayé d'être discret, Martine, mais j'avais besoin des images pour compléter l'histoire. I tried to be discrete, Martine, but needed the pictures to complete the story. It must be quite refreshing for them Ray. Ray: Cures everything from broken hearts to ingrown toenails, Chad. Ray: J'ai vécu près de 20 ans en Thaïlande, où les coutumes sont très différentes de ce à quoi j'étais habitué en Australie, Claudine ... il m'est apparu que la clé pour profiter / comprendre la vie dans une autre culture est de respecter cette culture locale . I have lived nearly 20 years in Thailand, where the customs are very different from what I was accustomed to in Australia, Claudine...it has become clear to me that the key to enjoying/understanding life in another culture is respecting that local culture. From your viewpoint I can sense you were being very careful to avoid breaking any tabboos. Ray: Living in Thailand for about 18 years has shown me many times that it is crucial to respect local customs, Brian. Someone has cast their colourful frock aside, Ray. 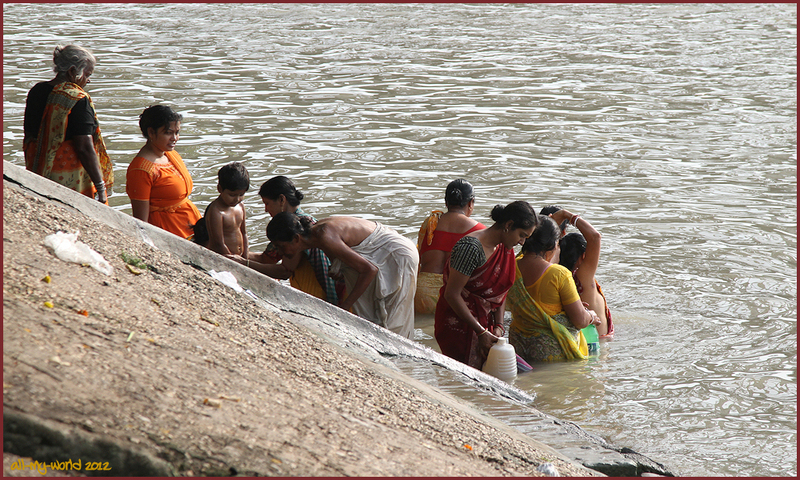 I'm guessing that men & women are segregated when bathing in the Ganges. Love the orange and yellow clothing colours. Ray: Colourful clothes are a feature of South Asia, Mary. Ray: If I am going to be bathing an adult human, Larry, then I would prefer that person to be female. i think you came away with good shots without causing a commotion, Ray.